L-R; Allison Daley, Claire Mills, Danita Stroup run on to celebrate with their team at the end of the semi final win against Australia at the 2017 FIL Rathbones Women’s Lacrosse World Cup at Surrey Sports Park, Guilford, Surrey, UK, 15th July 2017 (Credit Ady Kerry). 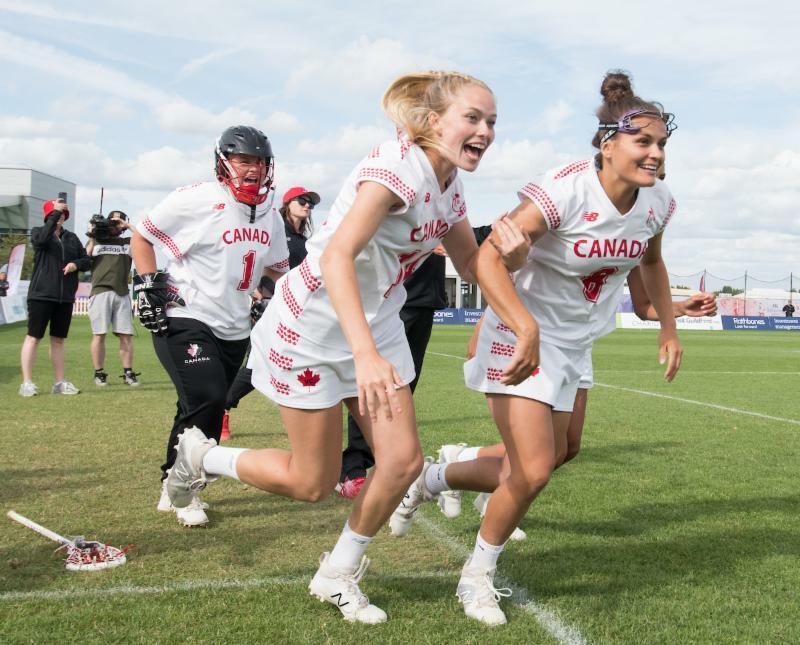 GUILDFORD, ENGLAND – Canada will play for gold at the 2017 FIL Rathbones Women’s Lacrosse World Cup in Guildford, England, after a thrilling 8-6 overtime win over Australia in the semifinals. They will take on the defending champion United States on Saturday, July 22 at 10:00AM EST. An incredible performance from goaltender Katie Donohoe, who made seven saves in the second half, helped Canada reach the World Cup final for only the second time since its inception in 1982. They last played for gold in 2013, losing to the Americans on home soil in Oshawa, Ont. Donohoe turned away 12 of the 18 shots she faced, earning her the game’s most valuable player award, much to the delight of her teammates who were chanting her name as they lined-up for the post-game presentation. Canada let a 5-3 first half lead slowly slip away, with Hannah Nielsen eventually putting the Aussies ahead 6-5 with less than five minutes to play in the game, stunning the Canadian fans. The lead was short-lived, however, as a determined Dana Dobbie did her best to ensure that her team’s effort wouldn’t end in heartbreak. She received the ball along the goal line and exploiting a one-on-one matchup, rolling off her defender and firing a hard side-arm shot into the top corner to score the equalizer with 3:21 remaining in regulation. Canada’s defense would then successfully hold off the Australian attack in the dying minutes to force overtime. Dobbie’s goal seemed to deflate an already exhausted Australian squad, allowing the Canadians to take advantage. Megan Kinna would score the go-ahead goal on a beautiful drive 2:42 into the extra period to give her team the lead. Alie Jimerson added an insurance marker, with a man-up in the final minute, to seal the deal. While the team’s high powered offence has garnered much of the attention so far this tournament, today’s game proved the importance of having a capable goaltending tandem like Donohoe and Allison Daley. The Peterborough natives share a special bond, one that Donohoe is clearly grateful of. Canada will be in tough against an undefeated American team in this weekend’s final. The winners of seven World Cup titles advanced to the championship game after a 19-8 win over England in the other semifinal. The championship final of the 2017 FIL World Cup will take place on Saturday, July 22 at 10:00AM EST. It will be broadcast live on the BBC Sports website (geographical restrictions may apply), and will also be available to watch from anywhere in Canada via pay-per-view webcast provided by www.247.tv.